WELCOME TO BOUBOU BED AND BREAKFAST LUXURIOUS ACCOMMODATION IN RUSTENBURG. Boubou Bed and Breakfast is a 4-star accommodation establishment in Rustenburg. The Guest House is situated in the Magaliesberg Biosphere, for accommodation near Sun City and Pilanesberg National Park, 20 minutes from Rustenburg. Boubou Bed and Breakfast is nestled in the heart of the bushveld, and we pride ourselves in creating a homely atmosphere for optimal relaxation. Our unique location offers luxurious rooms and facilities in a tranquil and serene environment. Our name Boubou was derived from a quirky little bird known as the Bush Shrike, and its duet is a synonymous with the rich birdlife of the bushveld. The award-winning Boubou Bed and Breakfast can be found in the Magaliesberg Biosphere of the North West Province.The BnB is located very centrally near Sun City and Pilanesberg National Reserve, and offers 4-star accommodation to visitors to the area who wish to have a central base to explore the many local attractions, or just for a weekend or romantic breakaway. It is top ranked on TripAdvisor for B&B’s in Rustenburg and received certificates of Excellence from both Booking.com and TripAdvisor for 2015 – 2018. The drive here takes about 1 and half hours from Johannesburg and 20 minutes from Rustenburg. Our luxury accommodation takes the form of four rooms, three of which sleep 2 persons and one that sleeps 1 person. The best room offers access to a private bath spa / jacuzzi, shower and sauna, while all of the rooms allow access to the swimming pool, with air-conditioning, TV and DStv plus free Wi-Fi internet access. Breakfast is included with all rooms, while Dinner is an optional extra. Welcome to Boubou Bed and Breakfast, a 4 star Guest House for Accommodation in Rustenburg. We are not merely a stop over, but a destination. Boubou Bed & Breakfast, a Guest House in the North West province, offer 4 luxurious en-suite rooms to stay in, all harmoniously and individually decorated to suit your needs. There are various facilities available at Boubou Bed & Breakfast, like a swimming pool, picnic opportunities, safari’s, and optional traditional South African dinners. We stayed in a room with direct access to the terrace over the garden. Bird watching from the outlook point (Lapa) was also very nice. Room was neat and clean. Staff and owners were very friendly. The dinner (Braai) they prepared for us was excellent. The plot is very beautiful and peaceful. We were warmly welcomed by Piet and the helping stuff was friendly. Best views from the outside top lounge and pool area. Will definitely book again when around the greater Rustenburg. Very beautiful place, in a peaceful out of town surrounding. The rooms are lovely and the bedding exceptional. We felt welcom from the beginning and we had a beautiful time. If we come back once, we will stay in Boubou again. 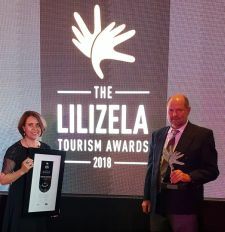 Boubou Bed & Breakfast is once again a provincial winner in the category 4 star Bed & Breakfast of the Lilizela Tourism Awards for Service Excellence. We have now taken the prize in this category in 2016, 2017 and 2018 for setting the benchmark in service excellence, contributing to the industry, investing in skills provision, leading by example and for ensuring that each guest is given a world-class experience in the North West Province.Thank you for everyone who voted for us! Boubou Bed & Breakfast has been named a Best Value Rustenburg Establishment.